From the options above, please choose the thickness of lenses you require putting in your frames. 1.5 Index standard plastic lenses are the industry’s basic material. All coatings can be applied and all tints can be applied too. You can order for single vision, bifocals & varifocals. Guide only – We recommend for prescriptions between +4.00 & -4.00. Please note: Standard Lenses are only available for Fully Rimmed and Semi-Rimmed frames. 1.6 Index thin lenses are 25% thinner and lighter than standard 1.5 lenses. All coatings can be applied and all tints can be applied too. Can also be used for Transitions, XtrActive and Polarised and you can order for single vision bifocals & varifocals. Guide only – we recommend for prescriptions between +6.00 & -6.00. 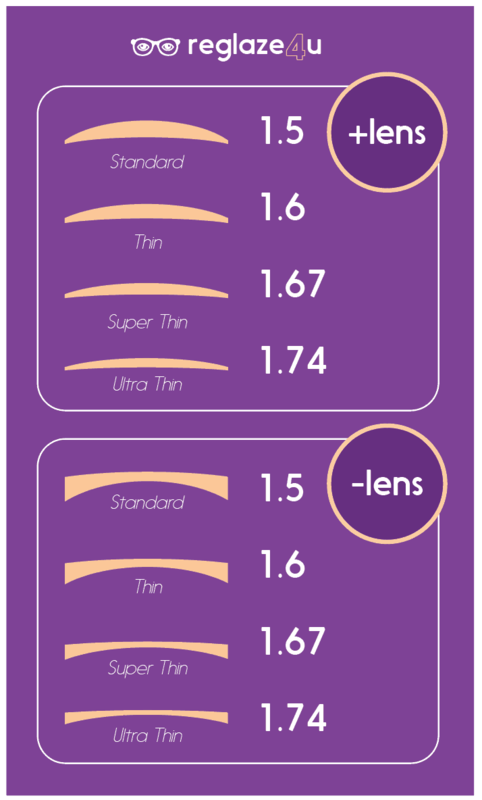 1.67 Index thin lenses are 33% thinner and lighter than standard 1.5 lenses. All coatings can be applied and all tints can be applied too. Can also be used for Transitions, XtrActive and Polarised and you can order for single vision bifocals & varifocals. Guide only – we recommend for prescriptions between +8.00 & -8.00. 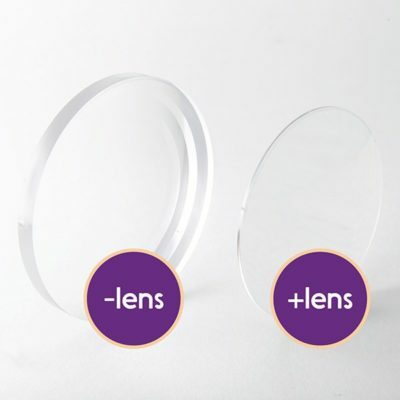 1.74 Index thin lenses are 50% thinner and lighter than standard 1.5 lenses. All coatings can be applied and all tints can be applied too. Can also be used for Transitions and you can order for single vision & varifocals. Guide only – we recommend for prescriptions over +8.00 & over -8.00. Offers superior impact resistance. Due to its superior strength it makes a great choice for today’s stylish eyewear frames. Ideal for sport, protective eyewear & rimless. These lenses are some of the most durable & lightest available with extremely high levels of impact resistance.